Grand Theft Auto V is a title that, like The Last of Us Remastered, was ahead of its time. And because of this they are much more at home on the PlayStation 4, despite not having been initially designed with the current generation of consoles in mind. Instead of being a quick cash-in, Grand Theft Auto V on the PlayStation 4 has new features and soundtrack that make the sordid adventures of Trevor, Michael and Franklin a guilty pleasure worth indulging in all over again. I have long been appreciative of the Grand Theft Auto games and their technical ability to run without loading screens and be able to deliver active worlds, but the settings never particularly appealed to me. Being more of a swords and sorcery fan, fantasy open world settings have always had the most appeal for me. However, when we reviewed the game on Xbox 360 over a year ago, it was clear that this game was something special, and I would inevitably play it. So imagine my surprise when I found the world of Grand Theft Auto V to be wholly engrossing and a title I seriously did not want to put down. First and foremost I was wowed by the incredibly immersive atmosphere Rockstar has created. The city of Los Santos is a sprawling one that is almost impossibly alive. I am used to open world games like Skyrim proving NPCs who walk certain paths during certain times of the day, but behave like robots. Here the people of Los Santos actually act like they are carrying on with busy lives and it makes the experience that much more organic. This organic, naturalistic nature of the city is emphasised by little touches ranging from passing animals, hundreds of songs to play over the radio as you drive around the city (including a number of new ones for this release), flipping on the television to see multiple programs running at any given time and so much to see throughout the sprawling metropolis. I found it entirely too easy to explore just to see the sights and sounds. Many games have open world environments with plenty of objectives, and those can be found here as well, but the fact that Los Santos is interesting enough to explore without actually going after an objective. I have not spent this much time on a game just 'killing time' since I was decorating my houses with various weapons and artefacts during The Elder Scrolls IV: Oblivion. It was more of an experience at that point, and not so much about the game. All of that being said, there is a lot of game to be had here as well. The decision to have three playable protagonists (there is no way you can really refer to them as heroes here) that all view the city of Los Santos through different sets of eyes really helps to hammer home the fluid nature of a city that is different things to different people. Some of the characters are easier to relate to than to than others, but what is constant in GTAV is the violence and crime, which works like a grimy guilty pleasure. Because the world is more naturalistic, the violence here feels more palpable than in other games with similar content. It's all deliberate, but is no doubt the underlying cause why the game has put some people off, and it certainly is not a game for younger children to be playing. All of that being said, I found it almost impossible to put it down despite my own doubts that I would enjoy the game's themes. 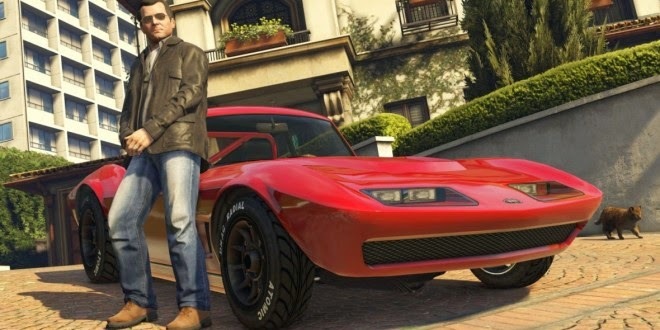 If all of this had just been a simple port of the game that released a year ago, Grand Theft Auto V would be a great way to lure in new players who had not given the game ago initially (such as myself). While the updated visuals are certainly impressive, with shadows that stretch long with the rising and setting of the sun, better lighting effects and a more realistic environment in general - the addition of a first person mode is truly awesome. On some levels it changes the gameplay (I actually preferred using the first person view when shooting at people because it felt more natural given my experience with FPS titles), but in others it simply serves to further enhance how immersive everything is. It would have been easier to just change the camera's view to be in front of the model's face and go from there, but instead the first person perspective brings some newly rendered material into play you might not otherwise see. 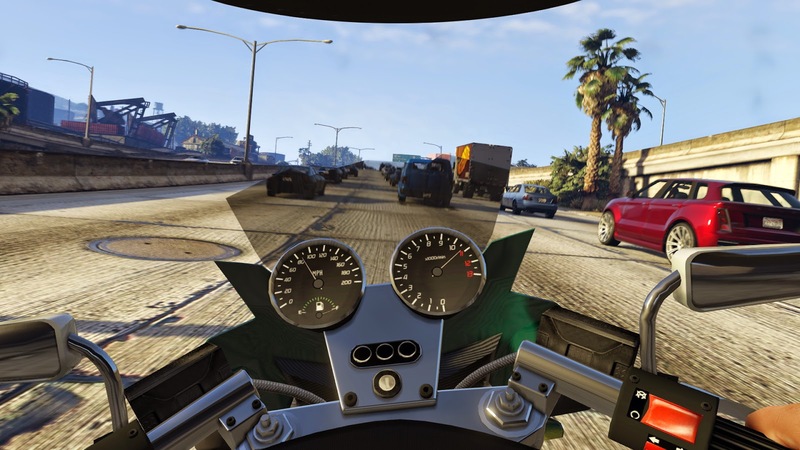 The most notable example is inside of the different vehicles you acquire during play (it is called Grand Theft Auto after all), which adds a good deal of realism to the experience. And make no mistake, this could not have been a simple bit of programming to achieve. 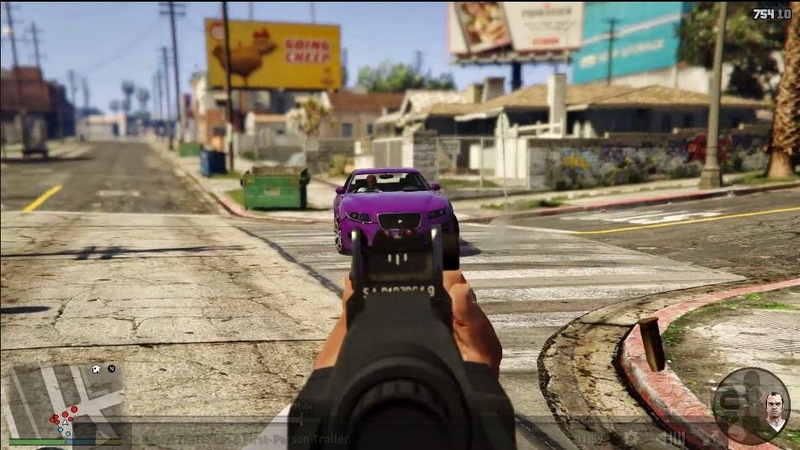 Rockstar has outdone itself with this mode, and created a new benchmarch for a minimum effort in remakes and re-releases on new generation hardware. If any game justified a re-purchases, it is this one. 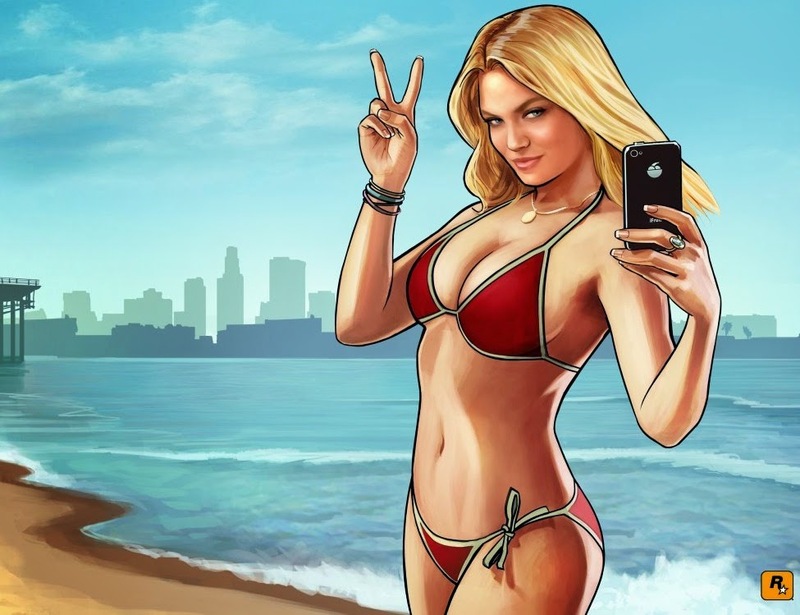 Rockstar deserves plenty of credit for the effective way in which it satirises society, but offers compelling gameplay while making a serious point. One example (without giving the joke away) is a darkly funny scene involving a new phone announcement that ends in a... unexpected fashion. People who have already played the previous release of GTAV should know what scene I'm talking about. As someone who has a few friends who are almost slavishly devoted to each new iPhone release no matter what the features are, I found moments like this relatable moments of social commentary. And sure, these protagonists are hard to cheer for, but you become invested in the nonetheless. Right or wrong (usually wrong) the actions of Franklin, Trevor and Michael are something you end up owning and taking mental responsibility for, and like the best anti-heroes of literature, you're probably going to learn something about yourself in the process. After (or before I suppose) finishing up with the main content, there is also a surprisingly robust online mode. Once again Rockstar have gone the extra mile and offered the first person perspective, but that takes a back seat to the impossible hijinks you can attempt to pull off with your friends. Item Reviewed: Review: Grand Theft Auto V (Sony PlayStation 4) 9 out of 10 based on 10 ratings. 9 user reviews.